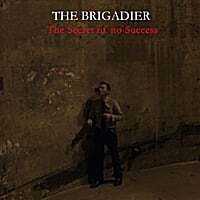 The Brigadier-The Secret of No Success. The power pop concept album about life in an office isn't exactly a novel concept as recent releases from Greg Pope's Edmund's Crown, Owen Sartori and Semion have demonstrated, but in our world the tune comes first. And Matt Williams (a/k/a The Brigadier) puts a tuneful spin on the topic with his latest opus, nowhere more evident than in the jaunty opening track "Doing the 9 to 5", which sees Williams moving away from the Brian Wilson-via-XTC sound of his previous releases into something more along the lines of Badly Drawn Boy. Other standouts include the irresistible (and rocking, as far as Williams goes) "Just a Little Kiss Miss Busy", the George Harrison-inspired title track, and the catchy "Money is the Motivator". His previous releases have been consistent, but here the highs are higher (especially the tracks mentioned here), making this the best Brigadier yet. Blake Jones & The Trike Shop-The Underground Garden. My only previous exposure to Blake Jones & The Trike Shop was on an IPO compilation before he sent me his latest full-length, and until now the loss has been mine. This is buoyant, just plain fun and catchy as all get-out pop that draws on everything from dance-hall English pop to the Beatles and Brian Wilson (cf. "The Five Deadly Fingers of Dr. Theremin") with a touch of Zappa thrown in. The fun-house Beatles of "Forestiere Gardens" will leave it's "oh yeah" refrain burned into your brain, the shambolic "Sing Along" will have you doing just that, and "Sun Up" starts as a rewrite of "Magical Mystery Tour" then takes its own magical mystery tour into a synth-pop break and then back again. Some tracks are just plain goofy, like "Fighting the Big Dumb Noise" and "Here Comes the Bus", while others are sublime, like "Send the Band to Liverpool" an amalgam of various styles of 60s pop. If you can get past the quirk factor, there's a lot to like here. And even if some of the tracks here might be goofs, there are 15 of them and anyone with taste in power pop should be able to come up with 10 they'll really like.